The last thing I want to write about at Christmas is Christmas. So, damn you all to hell, Charles Dickens. It’s impossible to write about “that Christian holiday” without sounding like Ebenezer Scrooge. Or worse, Jacob Marley. Let me just say that when it came to Christmastime, I had a happy childhood. In Indiana, baby brother and I were showered with gifts from grandparents to godparents. My first memorable gift was a car dashboard that lit up and honked its horn. Was so excited I pissed in my jammies. Years later, after we’d moved to Minnesota—and I’d had more than enough practice controlling my bodily functions—there was one special holiday season that I shared with my high school girlfriend, Kim, in December 1976. We shopped together, went to church, all very festive and cozy. We were all smiles that Christmas. So, I know it’s the season of giving and all, but as a kid it was the Season of Me. What’s in it for me? What will I get for Christmas? Me me me. I mean, this is how kids are hard-wired, right? Way short of being Samantha Smith brokering a peace accord with the Soviets, I’d wager I was like any other kid growing up in the 1960s: selfish, avaricious and often petulant—qualities that for the most part still fit the bill today. But back in Maryland, our first winter there, after Dad had made the big job switch in Indiana, the folks decided to pull out all stops. 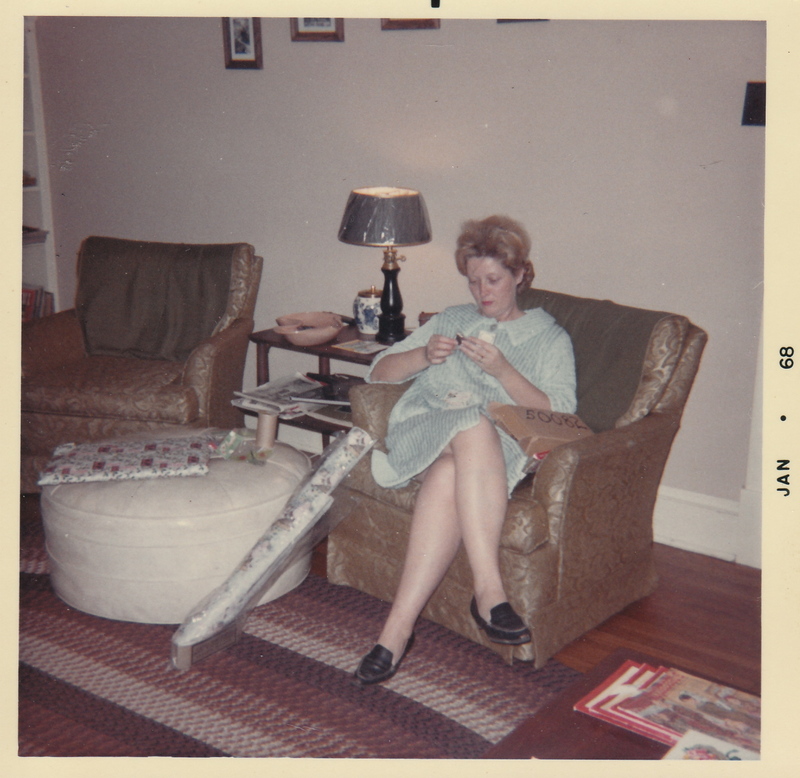 In retrospect, December 1967 was probably the best Christmas ever. 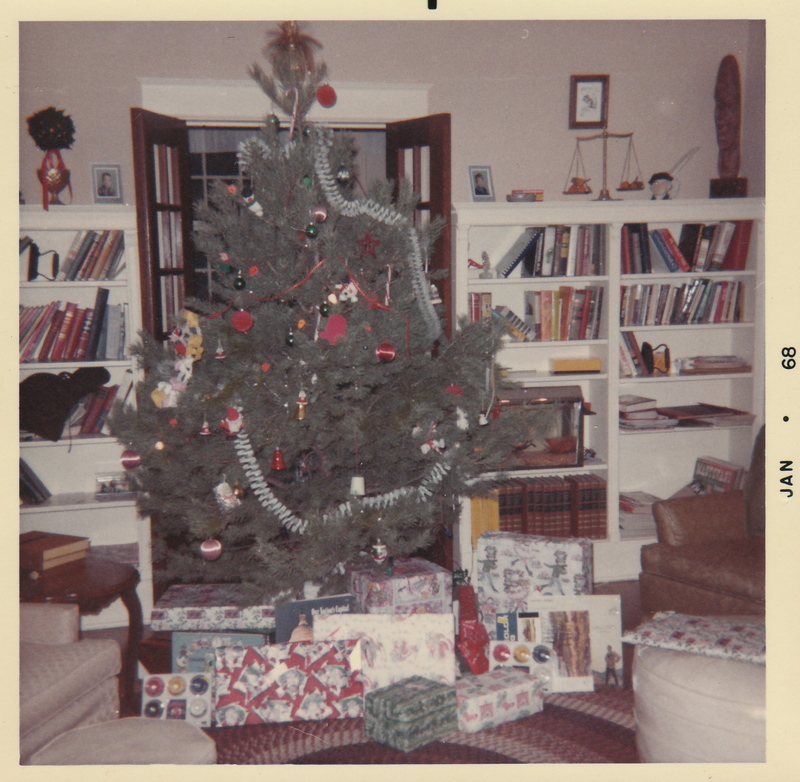 Looking again at the picture above, presents around the tree (a set of pastel paints for Brian and me, a book on Washington, D.C., and an LP recording of The Sound of Music, probably from Dad to Mom), brings it all back. The decorations on the tree came with us from Indiana: colorful cloth-wrapped globes, aluminum bells and glass ornaments—even a green plastic star with an aluminum fanlike center than sparkled and spun when it was hung over a Christmas light bulb (I loved that ornament!) … on this tree there are paper decorations Brian and I likely made at school. And I’d nearly forgotten Dad’s aquarium, his pipe tobacco, our World Book Encyclopedia, copies of National Geographic and Reader’s Digest Condensed Books. That Christmas morning was special; I just knew it at the time. 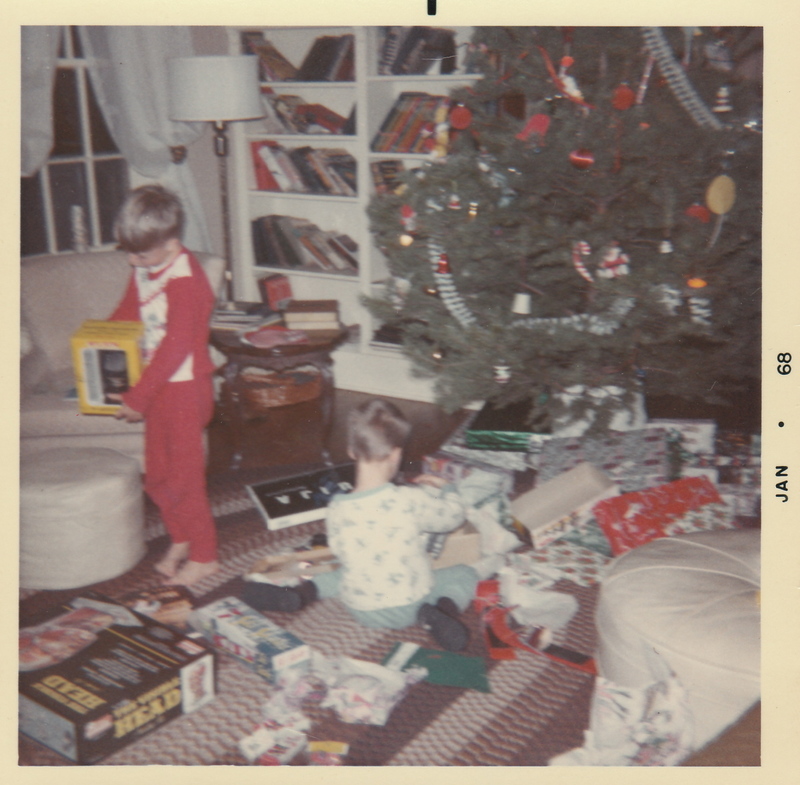 Brian and I got matching portable AM radios, an Ouija board (wondering what possessed the folks to buy that now), and I received all-out science-geek stuff like a microscope viewer (which I’m holding, above in the red pajamas). At my feet is the amazing Visible Head. Guess Dad thought I was going to be a scientist or doctor, so he was covering all bases in my education. Jingles, our tabby cat, got a treat from her own stocking. Those were the days when Christmas bubbled under your spirit, like an expectation that would surely be met and rewarded tenfold. It was a time to slow down, to enjoy things, to take stock of the year and look forward to what was ahead. My mother, at 32, was just learning to sew, so here’s her relaxing after the Christmas morning mayhem by tinkering with new patterns and material. What work it took to orchestrate this for two active boys! Dad was practically giddy hiding presents, and he loved to tell the “Santa came in the middle of the night” tale to get me and Brian to bed at a decent time. I get it now. That “work” translates as love. My parents weren’t perfect people, but they believed in what they did. And they hoped for the best for their sons by giving freely and joyfully. ~ by completelyinthedark on December 12, 2010. You know, that was the same for me too. Outside of the rest of the year, Christmas, for a time, was the one time BOTH parents pulled out all stops and gave all they had for the two of us kids. Interesting we both transplanted in MN in 1970 too. And to Minnetonka. et al!